The Saturn-Neptune Square: Dont Burst My Bubble! 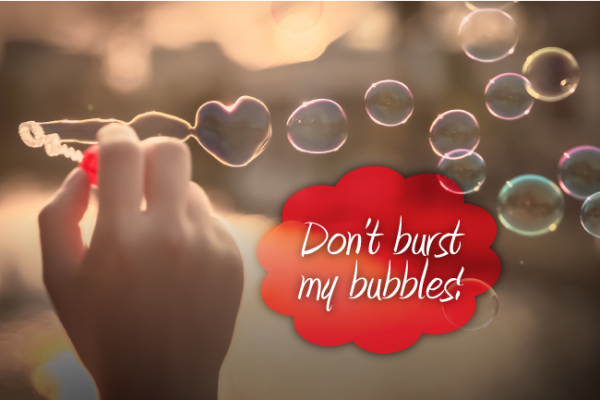 The Saturn-Neptune Square: Don't Burst My Bubble! Nobody likes their bubble burst. But it's bound to happen as Saturn in Sagittarius squares Neptune in Pisces now and for the next twelve months... You can already feel it. Unpleasant side effects? Being drenched in cold soapy water as you stare at your no longer so enchanting surroundings... It's a bit like sobering up after a fanciful night out. On November 26th 2015 Saturn made the first pass at Neptune, beginning a slow process of stripping away various illusions. This process will continue throughout 2016, as Saturn squares Neptune again in June and finally in September 2016. Bear in mind that this is an insidious influence… It gets slowly under your skin making you question your dreams and doubt your convictions. One thing it does is dissolve all you thought was rock-solid and unassailable in your life casting you adrift. Another is to shatter romantic fantasies that you were happy to labour under up till now and urge you to take a more realistic approach. But there is a positive side to all this. Are you a dreamer? You’ve dreamed the dream and it was great. Now that you're awake, you can finally pour your energies into making things happen! Are you more of a realist? Then you may waking up to the fact that your reality is not as solid or clear-cut as you thought... What is your soul crying out for? Time to give a little more credence to your flights of fancy. Put some soul into it! Yes, for those on Neptune's camp - the fog-brained, unrealistic chaps - this reality check can be a bit harsh. But the square, nose-to-the-grindstone Saturn chaps have an equally tough challenge: time to let go of rigid ideas and give your spirit more of a say. You see, bubble bursting can be a good thing. Blind escapism is definitely out. But so is playing it safe and not doing something about what gets you all misty eyed... Time to seek the riches of Heaven right here on Earth! Get creative - compose, write, paint, take pictures! This square happens between 7 and 12 degrees of the mutable signs (Gemini, Virgo, Sagittarius and Pisces). So if you have any planets or points (for instance your Ascendant or Midheaven) in the first half or so of the mutable signs you will feel Saturn-Neptune really intensely. Check out your free birth chart! So will those with birthdays between 25 November - 7 December, 25 May -7 June, 25 February - 7 March and 25 August - 7 September. Where is Saturn-Neptune bursting your bubble? Saturn squares Neptune from November 2015 all the way until September 2016. Read your star-sign and Ascendant to find out where you can expect Saturn-Neptune's sobering and softening influence... Alternatively give our gifted stargazers a call for a personal reading on 0207 111 6384! Get ready for strange images and unsettling memories to arise from the very depths of your soul making you question your beliefs. Your soul is impressionable just now so stay clear of too much television as it may have a curious effect on you, affecting your subconscious. The need to decide more clearly where you stand with respect to certain religious, moral, legal or political issues may create a kind of existential loneliness. This is the time to become more inclusive in your beliefs. Business-wise, you have your finger on the pulse and know what the people need... Marketing, media and publishing can become vehicles for creativity and philanthropy. Romantic dreams for the future may meet with harsh financial realities now, not to mention your own deep-seated fears. Alternatively if you are getting involved with a fanciful gang of people, this may present challenges in your personal relationships and cause a drain on your finances. An important friendship may be tested on issues of trust now too. All this may be unpleasant but it presents you with a once in a lifetime opportunity to face your fears and commit to the pursuit of your dreams. Your aspirations require a change in you now and for you to accept your personal power. This is also a chance to build trust, deepen your bond and share your dreams with someone special. A more spiritual or creative touch to your finances can be helpful as long as you can remain responsible and honour your commitments. A relationship reality check is in order that may challenge various vague and romantic notions around your status, goals, public image and life-direction. You may think you are headed somewhere in your own mind, but this won’t be realistic unless you and your partner are on the same page. By the same token, your own exalted ambitions may silently undermine aspects of your relationship. This is an important crossroads for you. It's time to sit down with your partner and decide how you want to take things forward. Is it time to make things official? Are you on the same page? Do you share the same goals? This is an opportunity to establish a relationship as equals, a solid yet inspired partnership that allows you both to reach for your dreams. Work realities may seem to shatter vague dreams of greater freedom - whether this is the desire to travel, study or simply elevate your station. This daily drudgery seems far from your dreams for a better life. At the same time, your search for meaning and your idealised vision for the future is interfering with your ability to work and function day to day, especially if your job is uninspiring. What a conundrum… But what seems limiting is also the road to salvation. The key here is neither escape nor submission, but rather to find meaningful work. Doing so can help you manifest your vision for a better life. Training and perfecting your skills can do the same. The key to freedom right now lies in discipline. A kind of spiritual daily ritual may be in order. You dream of the perfect romantic union yet feel far too sensitive and cautious to take a risk. Being overly idealistic may well set you up for disappointment, but do not despair. True love is a real possibility the minute you rid yourself of unrealistic romantic (and financial) expectations in love. It's time to throw away the script and listen to your heart. Daring to express yourself is the only way to eventual bliss. Allowing yourself to feel vulnerable will also help rid you of obsolete conceptions of love. Financially, stay well clear of dodgy investments and on top of taxes! Career-wise, this is a great opportunity to unleash your creativity or pursue a hobby, as this may lead you to find new riches. Your partner and family seem to get all in each other’s way, calling for some tricky manoeuvring. Home and family realities - whether this your mum or dad, your house or a desire to have a family of your own - may be breaking the magic spell in your relationship. At the same time your partner may be making it difficult for you to build the kind of life-foundation that you need to thrive. The key to all this is to rely more on yourself and less on others. This is actually an amazing opportunity to build greater self-reliance and establish a secure base for yourself from which to grow. This way your relationship can thrive and your partner can become a source of inspiration rather than a way to escape from your own responsibilities. Be open to what another brings to the table and less rigid about what constitutes the perfect family set up. Good intentions are worth little without you staying clear-headed and on top of things at all times. This is especially so now, when your immediate environment may become filled with blind spots ready to trip you up: in your inbox, on the way to work, on the phone… Get the facts straight, get all your paperwork in order and get a full health check-up while you're at it. Are your dreams of perfection at work or in your daily routine falling short somewhere? Go back to school and add to your skills! This is a fantastic opportunity to become an expert in your field. You are much more likely to be of service to yourself and others if you are willing to put your thinking hat on. Clear communication is also key. Let the idea of perfect service, perfect health or a job well done inspire you to learn and improve. Your creative aspirations may meet with financial difficulties now - whether this is turning your hobby into a profession, starting your own business or expressing your creative talents. Alternatively, it may be that a new love affair is making you insecure or taxing you physically. Children may also put a bit of a burden on your finances. All in all, the love may be there but the flesh (or the bank account) may be weak... No matter what, don’t let disappointments make you question your self-worth. This simply calls for a down to earth approach: What resources do you have available? Do the math. Make the best of them. Is there any way to monetise your creative talents? Is there a way to increase your self-confidence? This is a unique opportunity to take measurable steps toward your heart’s desires. It’s also a great chance to unleash your creative potential and make it pay in real, solid, measurable terms. Romantic notions of the past and even dreams of the perfect home and family life seem to clash with your own personal situation. Maybe you are feeling lonely right now? There’s no use idealising the past or beating yourself up as to what you could have done differently. It’s what you do now that matters. Alternatively, you may feel that home and family related matters are putting pressure on you. If so, this is a maturation process, where you are required to step up to the plate and take on your fair share of responsibilities. This may feel like a lot to take on but the subterfuge of escaping to a romantic version of the past or even looking to your parents for solace no longer works. It's time to dream your own dreams and to set up your own foundations. Growing up is the only way to do it and it doesn’t mean giving up on your inner child. This is a fantastic opportunity to reinvent yourself, inspired by your deepest needs and desires. It's also a great opportunity to create a beautiful home. You are dreaming of great riches but your social circle seems to be pouring cold water on the notion. Your friends just don't seem to share your highly idealistic and refined values, nor your fantastical ideas about how to create something worthwhile and improve your income. A little more realism on your part is essential but, by the same token, your associates do need the inspiration you bring to the table. Staying together as a team is key now. This will provide the platform for you to bring out your talents and establish yourself in the community. It's an amazing opportunity to put your idealistic and creative stamp on the world! But you cannot do it alone. And while a purely materialistic approach won’t do, nor will financial blindness. Join with practical-minded and realistic allies and make a go of it. This way you will get the best of both worlds. You’re a sensitive soul at the best of times and the world may literally bust in and burst your bubble now, shattering the rose-coloured glasses through which you see yourself and…everything. This reality check comes through mounting responsibilities, tough social realities and heavy worldly expectations. By the same token, your own perennial romanticism seems to undermine your ability to face up to certain truths and take charge. But rather than refuse to step up, you can turn your sensitivity to your advantage. By carrying your responsibilities with dignity, humanity and humility you can be an inspiration to us all. Rather than seeing your duties as spoiling your party, you could see them as an opportunity for achievement. This is a chance to bring your own uniquely sensitive and imaginative perspective on the world to bear on more than just your own personal reality. You can become a glamorous and inspired leader, take charge and make your dreams a reality here on earth!